Eric Andersen is an American singer-songwriter. 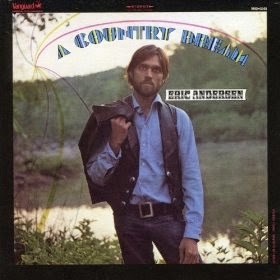 1969 saw Eric Andersen travel to Nashville to record a country-rock album, or at least one featuring full band arrangements that relied heavily on pedal steel guitar. It was a good idea, as his light, poetic singer-songwriter fare suited the countrified arrangements well, and let him fit in with the country-rock trends which were prevalent among the singer-songwriters of the day. An experienced team of seasoned Nashville musicians backed him on A Country Dream - Andy Johnson (guitar), Weldon Myrick (pedal steel), David Briggs (piano), Norbert Putman (bass), Kenny Buttrey (drums) and Charlie McCoy (various instruments including harmonica and banjo). Alongside some good new original material were covers of Otis Redding's "(Sittin' On) The Dock Of The Bay" and the old classic "Lovesick Blues". A beautiful recording that I'd almost forgotten. Thank you so much!